Below you will find a guide on how to obtain the correct model details to locate the parts that fit your appliance, a form you can fill in so we can assist in finding the correct part you need and some useful tips and advice. How do I find details of my model? It is important to have the correct model details from the cooking appliance that you are trying to fix. Incorrect details can result in incorrect parts as many parts from across our ranges can look very similar. On every appliance a Data Plate or Badge has been placed to identify the cooker, hob, oven or cooker hood that you are trying to fix. In some cases manufacturers may have placed a duplicate data badge on the user manual that was provided with your appliance. Step 2 - What numbers do I need from my Data Badge? Every manufacturer has a different set of numbers, codes and descriptions that indicate which version of an appliance you have. Please select your brand of appliance from the following drop down list to find out what information you need to get the right cooker spare part. Older appliances will have a gas council number displayed on the data badge usually indicated by GC or GCN. The GCN number will be represented by a 7 digit number usually beginning with 11*****. In the case of Cannon models ensure that you include the mark number represented by MK e.g. MK2 or MK3. This denotes which version of the appliance you have. Other important information you will find on newer models data badges is a Commodity or Production number. This is a long series of numbers 9 or 11 digits long which denotes which model and version of appliance you have. The only other number that you should note down is the serial number indicated by SN. This is a series of numbers can help identify changes in parts fitted to your model. There are 2 important parts of information that you require which is a model or Product number and a serial number to correctly identify which model and version of appliance you have. Model numbers can be indicated by 2 numbers. The First a code that contains a series of letters and numbers and the second a 9 digit number that usually begins with 05, 20 or 44. The later is the most useful piece of information and in some cases can also be known as a product number denoted by PN. The other number that you should note down is the serial number indicated by SN. This is a series of numbers that can help identify changes in parts fitted to your model. On newer appliances these is 2 important pieces of information that you require which is a Product number and a serial number to correctly identify which model and version of appliance you have. Product numbers are indicated by PNC and are represented by 9 or 10 digits usually beginning with a 9. The other number that you should note down is the serial number indicated by SN. This is a series of numbers that can help identify changes in parts fitted to your model. On this manufacturers data badge we are looking for an ENR number which represents the model and version of the appliance. You will also find and FD number and serial number (SN) which is worth making a note of as you may be asked for them. For this Manufacturer we are looking for a Model Number (MN) should start with a series of letters and numbers as well as a serial number (SN) which is a long series of digits beginning with 3. After January 1999 the number was replaced by a 6 digit number i.e 016645 and soon after that this number was increased to a 9 digit number. These model numbers usually begins with 05, 20 or 44 and are the most useful part of information. In some cases this 9 digit number can also be known as a product number denoted by PN. The only other number that you should note down is the serial number indicated by SN. This is a series of numbers can help identify changes in parts fitted to your model. Newer appliances have a model number which is usually a series of letters and digits. They also have an appliance product number which is 10digit number. It is also worth making a note of the serial number indicated by SN. This is a series of numbers that can help identify changes in parts fitted to your model. On your data badge you should find a series of codes that will help identify which model and version of cooking appliance that you have. Model number - Denoted by MN. Product Number – Denoted by PC or PNC. Serial Number – Denoted by S or SN. Once you have found this data please make a note of it and pop it into our search box. If you prefer why not run a Part Number Enquiry and let one of our cooker spare part experts do the leg work. For this Manufacturer we are looking for a Model Number (MN) should start with a series of letters and numbers as well as a serial number (SN) which is a long series of digits. Newer appliances will have a large 10 digit serial number which should take you to the right model. This number can be broken up into 2 parts , with the first 4 digits being written above the last 6digits. 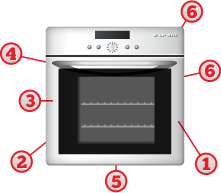 There is 3 codes on the data badge that is useful to identify which model of cooker, hob or oVen you have. The first a model number which is usually a series of letters and digits. They also have an appliance product number which is 10digit number. It is also worth making a note of the serial number indicated by SN. This is a series of numbers that can help identify changes in parts fitted to your model. When looking on your data badge, look for a Model number denoted by MN. This number tends to begin with the letter B and is a series of letters and numbers. . It is also worth making a note of the serial number indicated by SN. This is a series of numbers that can help identify changes in parts fitted to your model. Product Number (PN) or Service Number – This is a 12digit number usually beginning with 85. Serial Number (SN) – This is a series of number that denotes the build date of the appliance. Now search our system for your model to view the parts that fit your appliance or run a part number enquiry with one of our experts and let them find the part that you need. 1. Behind the main oven door. 2. The frame behind the door. 3. The sides of the door near the hinges. 4. Behind any other doors. 5. The base of the cooker behind the door. 6. The side and back panels. the kitchen unit drawer directly below (if applicable). 2. On the top edge of the appliance. How will a Part Number Enquiry help me? Can’t find the right cooker part? Why not let one of our Cooker Spare Part experts have a look for you. We may not have loaded your cooker, oven, hob or cooker hood onto our website yet, so please fill in your appliance details below. Please specify any part information, including colour of the required part (if applicable) in the additional information section. If your cooker, oven, hob or cooker hood isn’t working and you’re not sure why, it may be due to a common fault that may be relatively easy to detect. Below are examples of faults that our Cooker Spare Part experts come across on a regular basis. Warning - if your appliance is gas, do not try to replace the part yourself. This should only be done by a gas registered engineer. To find your nearest gas safe engineer please click here. Warning - if you are attempting to change any part of an electric cooker, hob or oven, please ensure that the appliance is switched off and unplugged from the mains. If you are unsure at any time whether the appliance has been removed from the electrical supply please contact an experienced engineer for advice. The oven fan is turning but the oven is cold. You can hear the fan in your oven turning but it’s not getting hot, it looks like your fan oven element, base element or top oven element has become faulty or blown. Not to worry just enter the manufacturer and model number of your appliance in the search tool and narrow the search to oven elements to find the correct cooker element for your appliance. The oven or cooker is not getting hot enough to cook. If you find that your electric cooker is not getting hot when you set the appliance to a certain temperature and you can even hear the circulating fan motor turning this could be due to the fact that the cooking element that produces the heat has become faulty. Another possibility is that a thermal cut out (fuse) has become faulty within the appliance and not sending a current to the element to heat the oven. The light in the oven has gone out. This scenario is very common and is easy to get fixed. Here at Cooker Spare Parts we stock a range of genuine and cost saving alternative cooker light bulbs and oven lamps. See our Lamps, Bulbs & lights section for more details. The cooker is taking longer to cook than it used to. This can be due to the escape of heat from through the oven door and in most cases you can feel the heat coming out from around the cooker door. The reason for this is that the cooker oven door seal has become faulty and is no longer creating a tight seal around the oven door frame. You can check this by trying to feed a piece of paper between the frame of the cooker and the door seal when the cooker door is closed. If the paper moves freely in and out it’s time to change the door seal which can be a simple process. Visit the Door seal section of our website, where you will find an array of genuine door seals as well as cost effective universal cooker door seals. The oven is cooking much faster than it used to and burning everything. This looks like your cooker is no longer regulating the temperature in your oven and points towards a faulty thermostat. A cooker thermostat keeps the oven at the pre-set temperature and when it stops working correctly it can no longer keep the temperature at the desired setting. Whether it’s a Gas thermostat or and electric cooker thermostat we carry a huge range of both, just enter your model number into the model search and find the right model number for you. Maintaining your cooker, oven or hob can extend the life of your appliance and can ensure that your appliance is kept looking in pristine condition. Here at Cooker Spare Parts we carry a range of professional cleaning products that can help keep your appliance looking like new. The best step of course is to avoid the build-up of grease, burn on foods and grime by using quality cooker, oven and hob degreasing agents and wiping the appliance down after use. It is also a good idea to ensure that pots and pans are covered to reduce spillages and to not let things boil over. When it comes to your oven a great tip is to line your oven with an easy clean liner that will save the base of your oven. 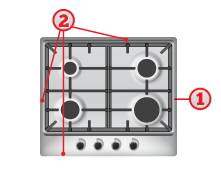 However if your hob already has a layer of burnt on food not to fear here at Cooker Spare Parts we carry a range of professional ceramic hob cleaners, hob degreasing agents and for those hard to remove stubborn stains we carry glass scrapers. If on the other hand it is your oven or grill that is looking tired we carry a range of oven cleaners and oven care products that will bring life into your oven. We also carry stainless steel cleaners that will bring the shine back to your appliances. If you just want to take the years of your appliance of continue to care for the cooker, oven or hob then please click here to see our great range of cleaning products.